Upon seizing power on 24 March 1976 the Argentinean military government unleashed a ‘Dirty War’ against Argentinean leftists and left-wing exiles in the country, as part of a rightist counterrevolutionary backlash against the Latin American left that had begun in Brazil over a decade before. A year into the ‘war ,’ on 30 April 1977, the mothers of those who had ‘disappeared’ by government-sponsored death squads realized they needed to organize themselves. The decision came after recognizing that the authorities were complicit in the disappearance of their relatives. The halfhearted responses to their requests for information had made it amply clear that the regime was hiding something. No family member believed that ‘uncontrolled’ right wing vigilantes were responsible or that their loved ones had gone under without letting them know. Azucena de Vincenti, the mother of a disappeared architecture student at the University of Buenos Aires, called on fellow mothers to form a pressure group to search for their missing offspring. After a year of individual fruitless appeals, it had become clear that the government was complicit and that the churches were unwilling to help. The mothers believed, rightly as it turned out, that the military, which subscribed to a highly regressive form of patriarchy, would refrain from attacking them head on. 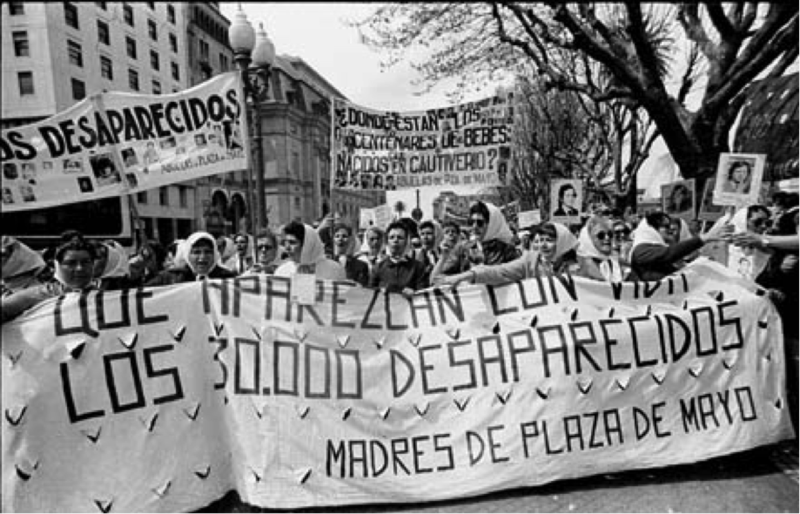 The Mothers of Plaza de Mayo searched for the disappeared, while protecting husbands and other male relatives from harassment or even being disappeared themselves. Framing their activism as a motherly concern devoid of politics, the mothers were highly effective. Their weekly marches around the Obelisk of Buenos Aires’s august square, the Plaza de Mayo, right in front of the seat of government, garnered them international attention. Argentina had received numerous waves of migration since gaining independence from Spain in 1818. The latest one had been after the end of World War II, when thousands of Europeans desirous of fleeing the continent in the wake of the disastrous war embarked towards the River Plate. By virtue of their foreign birth, the mothers and their Argentinean-born offspring had double nationality and enjoyed the protection of a foreign government. Annemarie Zieschank and Helen Marx had migrated to Argentina for entirely different reasons. Marx, a German Jew from Berlin, had arrived in Buenos Aires as a teenager in 1939, fleeing mounting Nazi persecution that eventually claimed her entire family. Zieschank, a member of the Nazi Bund Deutscher Mädel, had arrived in Argentina in the late 1940s searching for a better future away from a country ravaged by war. The fate of their children would bring the two mothers together for a common cause. Annemarie’s son Klaus and Helen Marx’s daughter Nora Gertrudis were left-wing activists, which was tantamount to a death sentence after the military seized power in March of 1976. After their kidnappings in March (Klaus) and August of 1976 (Nora), Annemarie and Helen, independently of each other, followed the conventional route of reporting to the local police and issuing an appeal for habeas corpus to no avail. They were forced to look abroad for help. Zieschank turned to her son’s fellow students at Munich’s Technical University to mobilize public interest in his disappearance in West Germany. Together they organized a hunger strike before the German Parliament in Bonn hoping to attract the attention of West German parliamentary delegates. The government of Helmut Schmidt, however, was uninterested in bringing up human rights violations with foreign states. The Chancellor’s Realpolitik stance towards international relations, West German business interests in Argentina, and especially the West German preoccupation with terrorism conspired against Zieschank. Helen Marx did not fare better in her requests for help from the German Embassy in Buenos Aires. Ambassador Jörg Kastl was convinced that the military would produce a positive turnaround in Argentina’s political and economic fortunes. Embassy staff was indifferent, and sometimes even hostile, to entreaties by relatives of ‘disappeared’ with ties to Germany. Helen and Annemarie thereafter joined the Mothers of Plaza de Mayo in their walks, and founded a subgroup of German-speaking Mothers. Their task would be to keep lobbying West German officials in the hope that through their intervention, the Argentinean government might be forced to respond to their supplications. The mothers found a ready ally in the West German section of Amnesty International. The human rights organization had grown exponentially since the early seventies, and had been a lonely voice calling for the acceptance of political refugees from Argentina. Amnesty activists had organized vigils in front of the Argentine embassy in Bonn, and been the major force behind the “Yes to Football, No to Torture!” Campaign, which had highlighted the atrocities in Argentina using the 1978 Football World Cup as the backdrop. The campaign had forced the West German government to reverse its stance of not accepting political refugees from Argentina and to pressure the generals more forcefully on the issue of the disappeared. By the coming year, however, it had become clear that the West German government was only halfheartedly pursuing both promises. Starting in 1979 and continuing through the 1990s, the German-speaking sections of Amnesty international and the German-speaking Mothers started organizing joint tours throughout the Federal Republic, Austria, and Switzerland to raise awareness about their situation, but shifted from an overt focus on the national government to local civil society. Henceforth, the groups most targeted would be local church officials, local politicians, trade unions, civic organizations, and the media. Their purpose was to create grassroots pressure that would force both politicians and diplomats to take a different approach towards the military regime. Their efforts bore mixed results. For example, while West Berlin civil groups responded favorably to the speaking tours of the Mothers and engaged themselves on their behalf, the city senate was leery of granting the Mothers’ request for an official sponsorship. The Mothers had sought this important symbolic gesture due to West Berlin’s position at the frontlines of the Cold War, but the foreign office convinced the senate that the act would represent an intromission into the internal affairs of a foreign country. Overall, politicians in the Federal Republic of Germany did the bare minimum to aid the German-speaking Mothers while the dictatorship lasted. After the defeat of Argentinean forces at the hands of the British in the Falkland War in 1983, tens of thousands joined the Mothers at the Plaza de Mayo in their demonstrations. As successive Argentinean democracies granted amnesty to the participants in the repression, however, the Mothers continued their advocacy shifting from searching for the missing to fighting impunity. The government of president Saul Menem (1989–1999), however, prevented Argentinean jurists from going after the military. After a former Navy officer, Adolfo Scilingo, admitted to having participated in operations throwing drugged prisoners from airplanes in 1995, an action that prompted others to confess their crimes, Spanish and Italian jurists worked to prosecute the suspected torturers and murderers using their national legal tools. In Germany, the Mothers, Amnesty International, and sympathetic jurists founded the Coalition against Impunity in 1998. The Nuremberg-based organization pressured the Federal Government to prosecute the murderers of German citizens in Argentina following the example of Spanish and French jurists. The government granted the request and tasked the Nuremberg state prosecutor’s office to take up investigations. The jurists assiduously interviewed embassy staff and relatives. In 2001, the Nuremberg District Court charged three former Argentinean officers suspected of kidnapping and murdering the German citizen Elizabeth Käsemann in 1977. Two years later, the court issued arrest warrants and requests for extradition to Germany against the former Junta members Videla and Emilio Massera, and First Army Corps General Carlos Guillermo Suarez Mason, who oversaw the most important concentration camps in Buenos Aires province. Argentina refused the extradition, but with the reason that the accused were being tried at home. Both Videla and Massera were convicted of having committed crimes and died in prison. After nearly thirty years of advocacy, the efforts of the Mothers and West German human rights activists were rewarded with at least a symbolic gesture from the West German authorities. 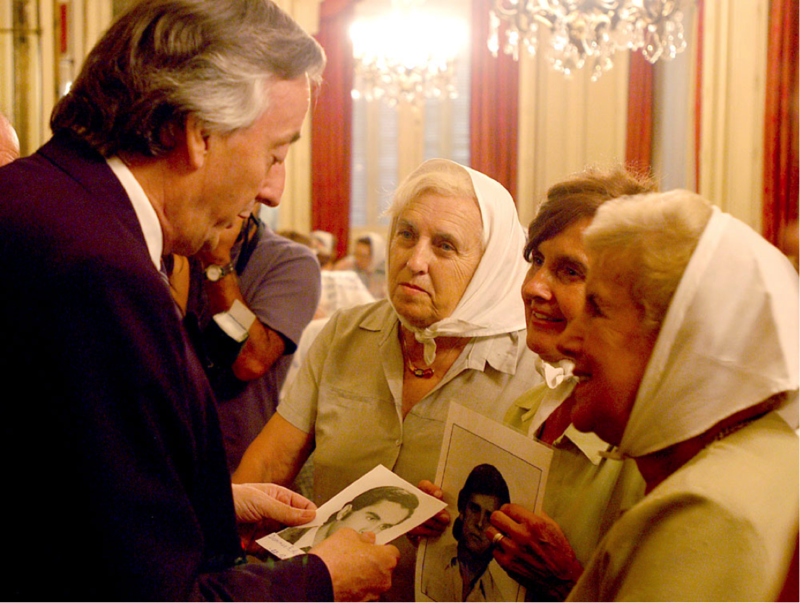 Although unsuccessful in putting the suspects before trial in Europe, with a few rare exceptions, the most tangible achievement of the Mother‘s international campaign was pushing Argentinean jurists and judges to begin processes against the amnestied military, which resulted in numerous convictions. The Mothers have become the subject of scholarly interest as a human rights organization that employed the tools of grassroots public protest. The mothers’ human rights advocacy has become a mainstay in the new historiography of human rights that sees the 1970s as the starting point of a new era of transnational human rights activism. Jan Eckel and Patrick William Kelly have pointed to the crucial role that Latin American transnational activists played in piercing the armor of Westphalian sovereignty that had until then shielded states from external scrutiny of their internal affairs. At the same time, Emmanuel Kahan and Gari Andsmann have criticized the mother’s emphasis on the humanity of the missing, which has purposely tended to obscure the radical political convictions that they held before being victimized. Eckel, Jan. Die Ambivalenz des Guten: Menschenrechte in der Internationalen Politik seit den 1940ern (Göttingen: Vandenhoeck und Ruprecht, 2014). Gandsmann, Ari. ‘The Limits of Kinship Mobilizations and the (A)politics of Human Rights in Argentina.’ The Journal of Latin American and Caribbean Anthropology 17, no. 2 (2012): 193–214. Kahan, Emmanuel N. Recuerdos que Mienten un Poco: Vida y Memoria de La Experiencia Judía durante la Última Dictadura Militar. (Buenos Aires: Prometeo Libros, 2014). Kaleck, Wolfgang. Kampf gegen die Straflosigkeit: Argentiniens Militärs vor Gericht ( Berlin: Wagenbach, 2010). Kelly, Patrick W. Sovereignty and Salvation: Transnational Human Rights Activism in the Americas in the Long 1970s (PhD Dissertation, University of Chicago, 2015). Félix A. Jiménez Botta is a PhD candidate at Boston College. His research examines the interaction between transnational social movements and states, with a focus on Germany and Latin America. Félix was a participant of the Global Humanitarianism Research Academy 2017. Citation: Félix A. Jiménez Botta. ‘Buenos Aires, 1977: The international struggle of the Mothers of Plaza de Mayo’, in Online Atlas on the History of Humanitarianism and Human Rights, edited by Fabian Klose, Marc Palen, Johannes Paulmann, and Andrew Thompson, 2017-10, urn:nbn:de:0159-2018012318 [2019-04-26].